Whistler proved to be one of the best weeks of our trip. The weather was perfect, Crankworx was going on, tons of riding in all directions, and we found a killer campsite along a roaring glacier river. Life was very, very good. We arrived just before the final weekend of Crankworx and the village was insane to walk around. It was like a party I have never experienced and everyone was ALL about bikes. The vibe was definitely electric....you could just feel the excitement in the air. All my favorite pros from all the videos were everywhere. In the evenings we would hang out in the village and watch all of them destroy the new slopestyle course (and film for their new video segments). 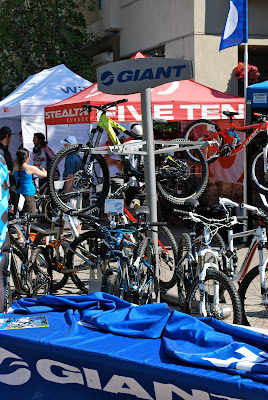 Much of the new 2011 stuff was out and many of next years bikes were available to ride as well. For us this was heaven. We would wake up, roll into town, hang out in the village and get a good "stoke" going on and grab a bagel. Then we would just go ride. There was great riding for free all around us. You don't even need to ride the lifts to enjoy what they have to offer. Most of our favorite rides ended with us riding down to a gorgeous lake and swimming with our dog at the dog beach. Then after playing at the lake all afternoon we would head back into the village for dinner, beers and more people watching. The week in Whistler probably stepped up my riding more than anything. I've been lucky enough to ride in places and on trials that are considered highly technical.......and I can ride most of it. I'm talking about stuff like Holy Cross in GJ for example. Let me tell you that the stuff in Whistler blew me out of the water. The level of skill that is common on many of the trails is way more complex and challenging than anything in the USA. Many of the technical features here come from the fact that they build much of the trail out of wood. Think of trails covered in teeter-totters and 10" wide planks (or less) some over 6' above the ground. And these are rated blue to single black here. The double black diamonds are simply way above my riding.....but.......I worked on it and have since grown a spot in my heart for the "North Shore" style riding. I'd end up spending the next month riding it all over Canada. 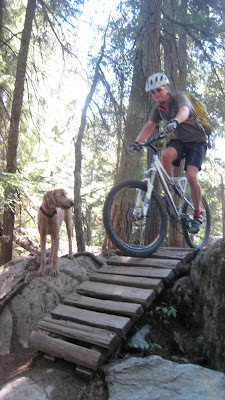 Canadian trail builders simply have a way more "burly" style of trail building. And there is way more people building trails here. More on that later. Though. After the hype of Crankworx faded we started venturing up the lifts. The Whistler Mountain Bike Park is well and above the best bike park in the world. Its not hard to see why either. The sheer amount of effort and money spent on building and maintaining it is into the millions. It is like nothing I have ever ridden in my life. I came here fully aware of how hyped it was and it still blew me away. I can't wait to come back next year. I'm sure its that mentality that keeps so many coming back every summer. It also explains why the best bikers in the world call Whistler home in the summer. Life's short. Every Mountain biker needs to ride this place at least once. **Due to user error I accidentally deleted the majority of our pictures from Whistler. Bummer....I know.